The New User Setup includes coaching tips to help you navigate through your first tasks so you can get up and running easily. 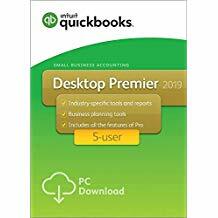 QuickBooks Premier accounting software (Multi-currency) QuickBooks Premier Accounting Software includes pro function and alsoKeep track of your biggest moneymakers so you'll know which products to promote and keep in stock, and which to drop from your line. Easily find and locate inventory tasks by accessing your inventory items and reports all in one place with QuickBooks Inventory Center. Add a notes field to each item for quick identification. (Multi-currency) QuickBooks Enterprise access your inventory items and activities all in one place with the Inventory Center. Enter received inventory by item receipts and bills or by purchase order, and change assembly components on the fly. Know where your business stands with over 180 built-in reports or custom reports you create. Easily track your sales and expenses, and instantly prepare for tax time. 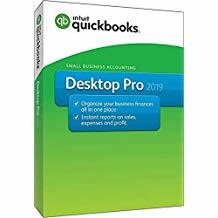 Combine reports from multiple company files, create financial statements and custom reports and export, save, and reuse your QuickBooks report formatting for spreadsheets. 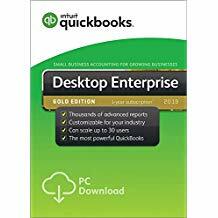 QuickBooks Enterprise accounting software 2019- 5 users, 10 Users, 20 Users 30 Users. 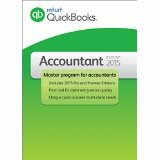 A ccess all QuickBooks editions in one package. Plus, work with multiple client files at the same time. Increase efficiency by working on the same file as your client — simultaneously.